Through live streaming, I’ve had the pleasure of meeting hundreds of new people and creating a few amazing friendships. 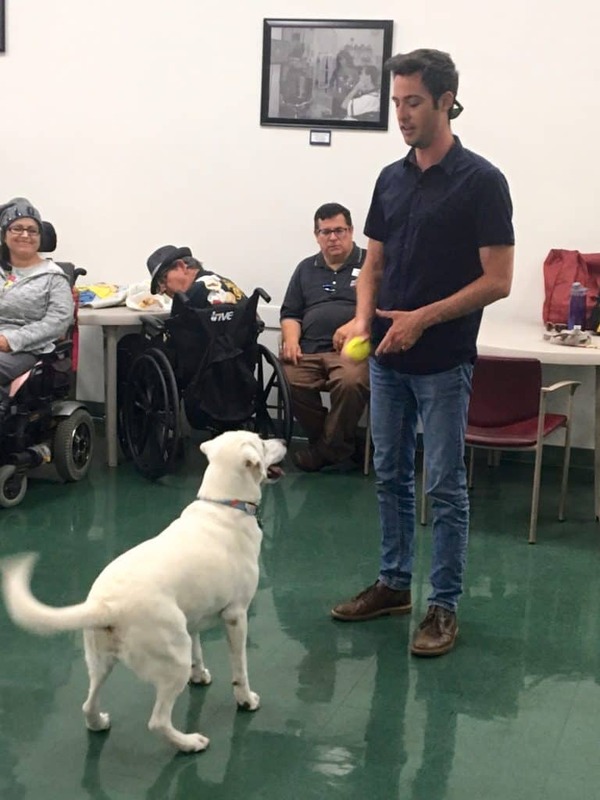 Through Busker, Mary Desmond and I have developed a friendship which led to an incredible opportunity to volunteer at the High Hopes Head Injury Day Treatment Center in Orange County, California. High Hopes is a non-profit started in 1975 that aims to help and assist those who are affected by traumatic brain injuries. These brain injuries can occur from car accidents, bicycle accidents, drug overdoses, or any other random event. 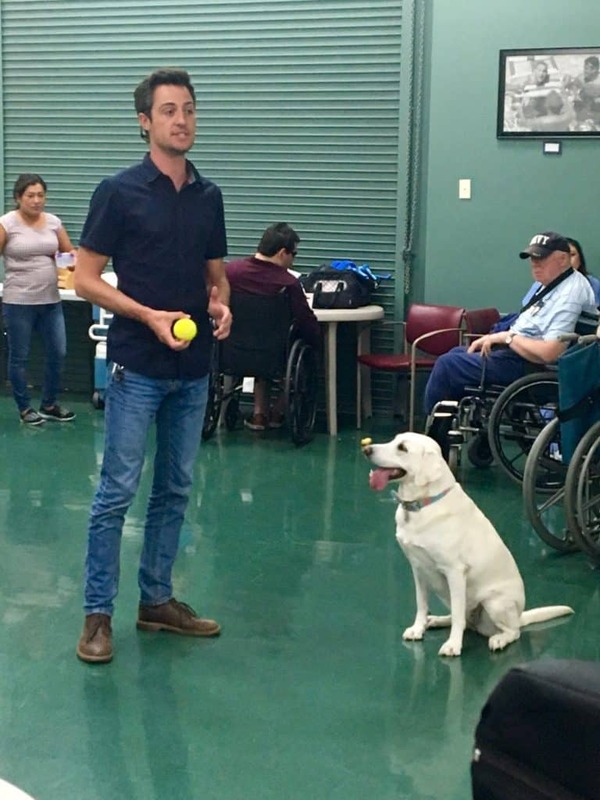 On August 22nd, Callie the Lab and I went to High Hopes to interact with some of their amazing students and completed two dog training demonstrations. As always, Callie was a huge hit! When I first arrived at High Hopes I was prepped for the people I would be meeting. I was told that these people were just like me at one point. Fully functioning, able to speak and communicate with no issues. I was warned that some people may have involuntary reactions while others may not react at all to my presence, even though they might be fully aware Callie and I are with them. In college, I worked with Best Buddies, an organization to help those with special needs. What I learned through Best Buddies is to treat everyone as if they were normal, because, at their core, they are. I don’t “baby talk” anyone. I don’t pretend that they don’t understand. I just speak to them as if I were speaking to my best friend (but maybe without the colorful language). I explained this to the staff, and they seemed quite relieved. They said, “Good. That is exactly how you should act. They are fully aware – even if they don’t seem like it.” They then asked, “are you ready?” I said, “yes.” And we were off. 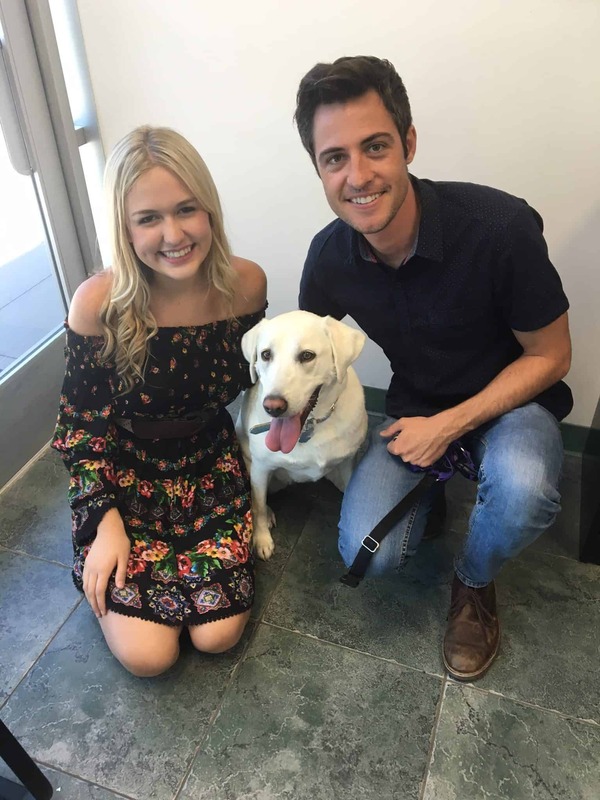 As Callie started to make her rounds, we met a man named Brian. When you saw Brian he looked like anybody else. You would never know he had a traumatic brain injury by looking at him. When we approached, I asked Brian, “What is your name?” He said, “My name is…” and then paused for at least 5 seconds. Somebody jumped in and said, “his name is Brian” to which Brian pointed and nodded in agreement. I was then told that Brian understands everything we are saying but is unable to show facial expressions. He is also unable to respond as quickly as his brain works. It now made sense. He knew his name was Brian, it just takes him longer to form that thought into words than a normal person. Brian was sitting at a table with people performing a variety of simple tasks. Tasks like: putting blocks in a bowl or pinning clothespins on a board. Tasks that you and I would never think twice about completing but for these people pose as great obstacles. These are tasks that have to be relearned as adults. Brian loved Callie and Callie LOVED Brian. She crawled up in his lap, gave him a few licks, and Brian was able to tell her thank you by patting her on her side. Callie is pure white. Like a polar bear. 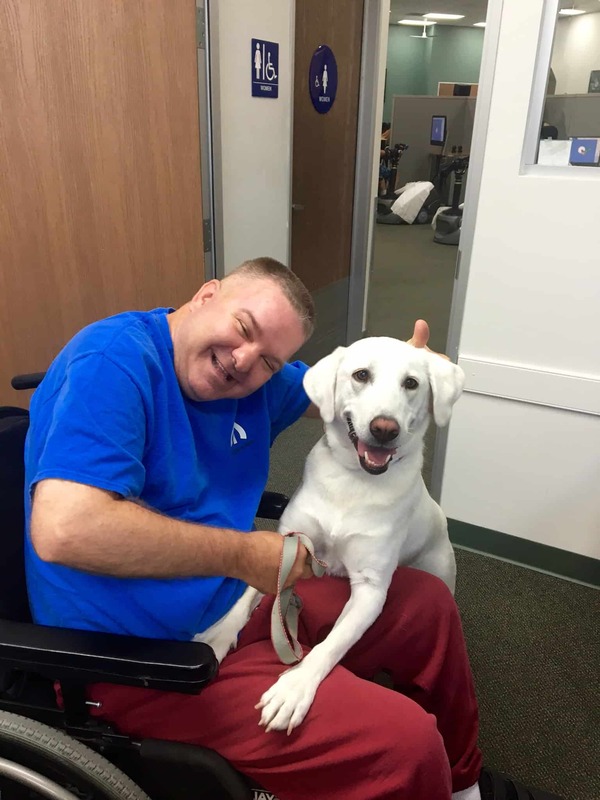 However, she is not a white lab – she is a yellow lab. This makes her different than all the other yellow labs. People love this about Callie. 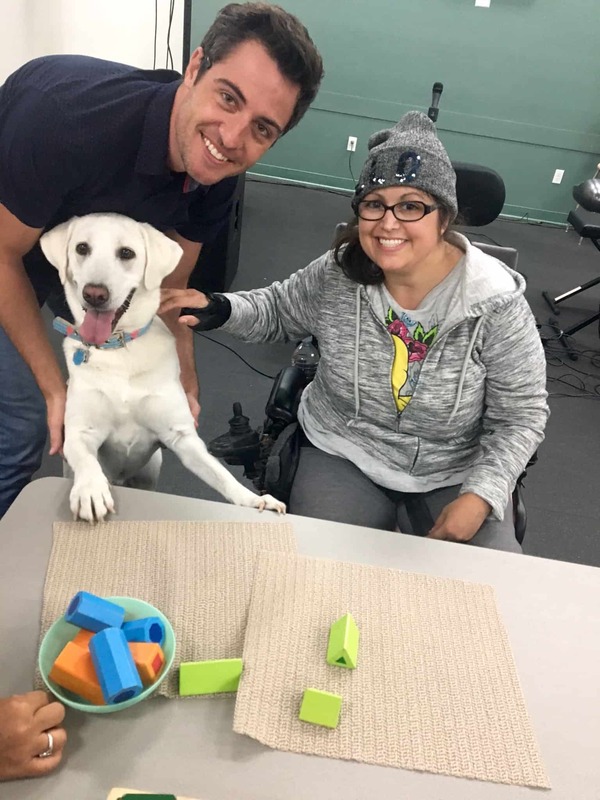 During one of my dog training demonstrations I explained this to the students and that we are often stopped out in public to talk about this unique feature of Callie’s – being all white. Yes, Callie is different than most yellow labs, but she can still do all of the other things yellow labs do. She can sit, stay, lay down, walk on a leash, fetch a ball, and chew up a pillow. She can do it all, just as a white yellow lab. Just because you are different, that doesn’t mean you are less. Callie cannot roll-over on command. She just can’t do it. I have tried and tried, but no matter what, she struggles to roll over. I explained to the group that Callie could do all of these amazing things like jump, fetch specific objects, weave through my legs, but she could not complete the simple task of rolling over. I went on to explain that just because she can’t do this one thing – doesn’t make her any less of a dog than another dog. It’s just a part of who she is, and she has learned to be, probably, the one dog in America who is owned by a professional dog trainer who can’t roll over! Let’s also point out that she is also one of the happiest dogs in the world. To prove it to the group, I asked Callie to lay down and then asked her to roll over. She tried and tried, wiggling like a worm, and eventually did some version of the behavior. I hope at least one of the students got what I was trying to do. You may not be able place a block in a bowl or a clothespin on a board, but it doesn’t mean you are less. I think many of them got it. After my second dog training demonstration, I talked to a student named Patti. Patti was a bicyclist who suffered a brain injury during a bike ride in Colorado. Now, Patti seemed to act more like a teenager in high school than the 20-something she actually was. She was delightful, however (unlike most teenagers in high school. ha!). Patti had lots of questions about Callie and dog training. After I answered her questions she offered to tell me a joke. I LOVE jokes, so I got quiet and listened. Of course, I died laughing and also groaned a bit at such a subtle but not so subtle joke. Patti was laughing too. She was happy I reacted the way I did. Then, abruptly, Patti stopped laughing. She got very serious. I was taken aback. It wasn’t what I was expecting immediately after a dumb blonde joke. “Yes. Of course,” I said. She said thank you and then walked away with her caregiver. I prayed for Patti as soon as I got in my car. I prayed for everyone at High Hopes. You should too. High Hopes is only able to maintain their terrific work in these peoples’ lives through donations. This is a non-profit organization which needs roughly $1,000 per month to help a single person. This sort of work isn’t simple, so if you want to do more, you can make a donation through their website. Callie and I doing some training demonstrations.